No doubt the inspiration for the name “Immaculate Consumption” came from a happening 9 months prior to Christmas (how appropriate), many thousand years ago, when the virgin Mary conceived a child. A time of much confusion for a certain soon-to-be-husband. Catchy name, but if any sandwich tries to immaculately consume itself down into my stomach without even the least bit of hanky-pank with my taste buds, my money is going to immaculately appear back in my wallet. Above is the “Big D”. I know, I know. 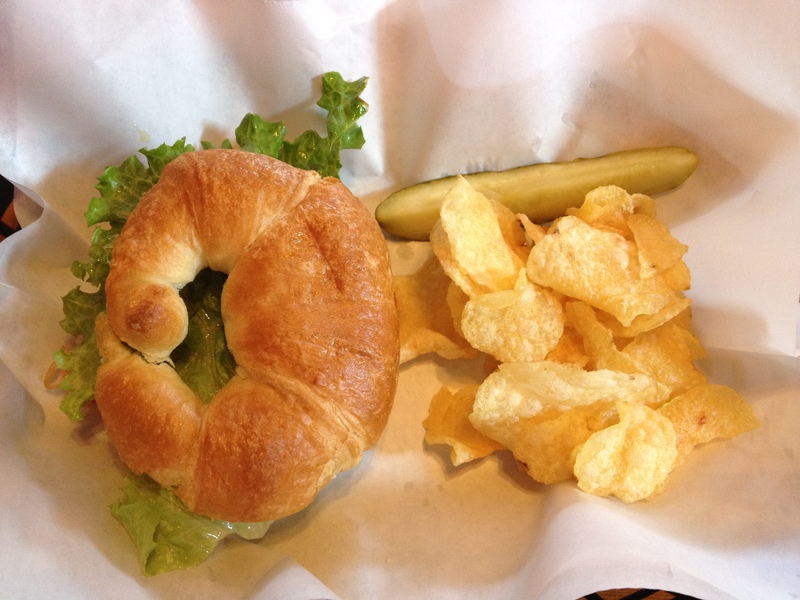 It’s way more fun to get the street view of the sandwich, but just look at that golden brown croissant. Sandwiched in between the soft-but-slightly-crispy croissant was a layer of turkey, white cheddar, cherry tomatos, green leaf, and homemade honey mustard. I guess now we know what the “D” stands for. 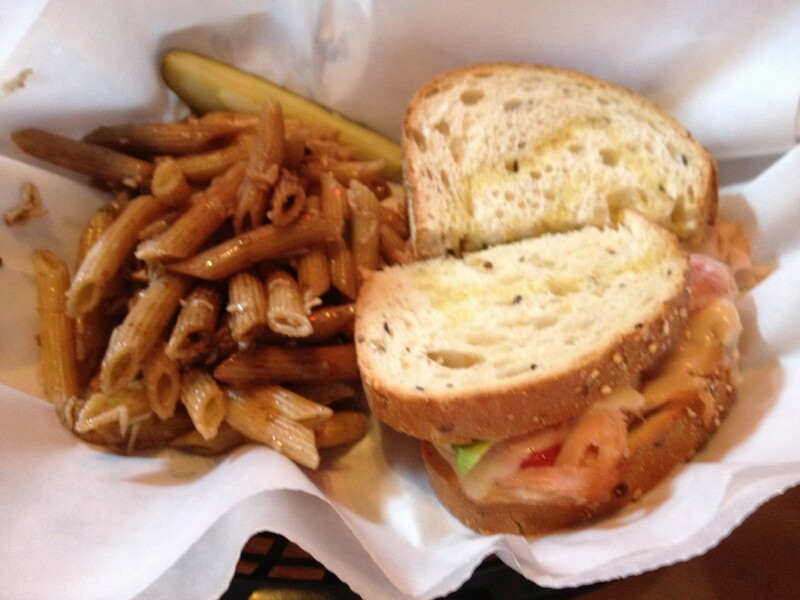 Had I known what I know now, I would have opted for the pasta salad rather than the chips. Following that weak attempt at a joke (D stands for Delicious) is one of Immaculate Consumption’s daily specials. Turkey, provolone (I think), cherry tomato, and a slice of avacado; All held together by two slices of whole grain bread drizzled with olive oil. 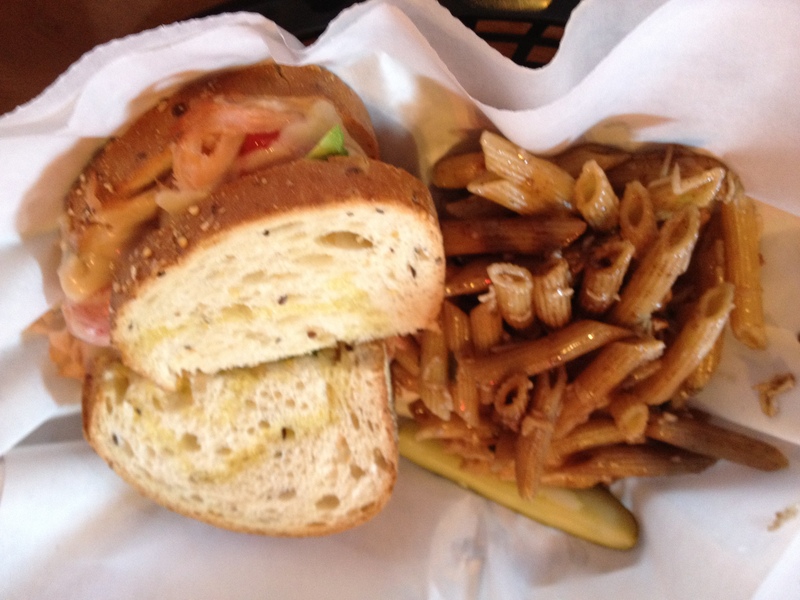 This satisfying sandwich was accompanied by a heaping portion of some of the best pasta salad I have had the pleasure of trying: whole wheat penne tossed with olive oil and parmesan, served warm. We washed it all down with a cup of coffee for me and a caramel latte for my lady. ZING! CAFFEINE! They roast their own coffee beans in the basement and probably make a mean cup o’ joe, but as of yet, I have not acquired an experienced coffee palate, so I dare not speculate. Immaculate Consumption should be on your list of Columbia, SC restaurants to visit. Nice atmosphere, a variety of sandwiches, and plenty of seating downstairs for those who like to work near their coffee. Conveniently located on the lesser traveled end of Main St., right next to the Nickelodeon. Let us know if you want us to feature your site here! We are happy to further the interests of all things South Carolina.